This document is available in Portable Document Format (PDF). To view this document, you need Adobe Acrobat® Reader installed on your computer. Click button to get Adobe Acrobat® Reader. water-quality records for 66 streamflow stations (34 ungaged), and 13 ground-water wells. cooperating State and Federal agencies in Montana. gage and miscellaneous-measurement sites were collected but are not published in this report. These data are stored within the District office files in Helena and are available on request. 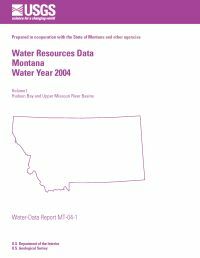 Survey and cooperating State and Federal agencies in Montana.